TVU Networks which provides live Internet TV services has announced that it has surpassed one million downloads for TVUPlayer on the iPhone and the iPod touch. 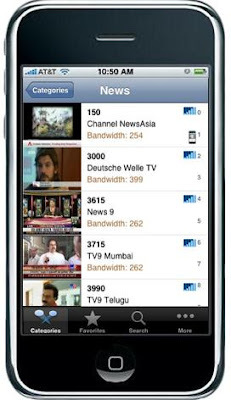 iPhone users use this TVU Player App over wifi connections to watch 300+ live channels. TVUPlayer for the iPhone holds 31st rank among top 100 entertainment apps.TVU added many new features for its iPhone app which made the app a hot selling cake. Paul Shen, CEO of TVU Networks states, "To be ranked 31st in the top iPhone Entertainment apps - considering there are 93,000 apps available from 125,000 registered developers being sold in the iTunes App Store today - demonstrates the tremendous value users see in TVU. Our cross-platform live TV service gives viewers instant access to vast amounts of live TV from around the world anytime, anywhere."